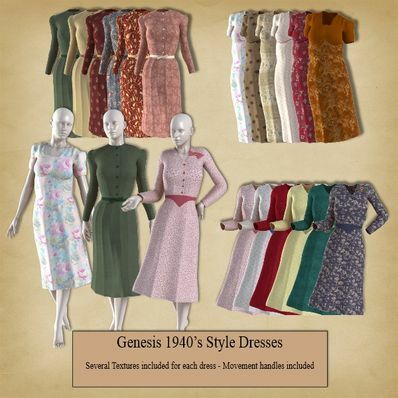 3 1940's style Dresses for Genesis for use in Daz Studio 4.6. Thank you so much! Just what I needed. Thanks for creating & sharing these classic 1940's dresses, Wendy. Great dress, wonderful textures. Will go great with those 1940's cars, thank you! Thank you so much! Wonderful stuff! Wow, remember in the 50s a sign in a Louisiana restaurant saying, "No Dogs or Mexican's allowed" it made feel sad as a child. Never forgot it and I was only 6 at the time. Thanks for the outfits.